Digital UltraViolet and Digital Copy will makes it possible for you to stream the movie How to Train Your Dragon: The Hidden World UV or iTunes Code instantly to your computer and compatible Smartphones, Andriod, iphone, iPod Touch, iPad and tablets devices anytime, anywhere. 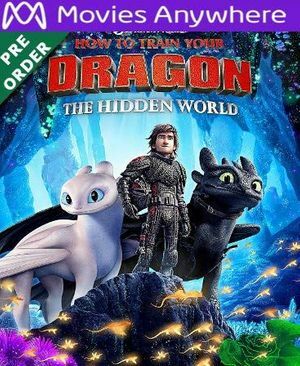 You can also download a Digital UltraViolet Copy or a Digital Copy of the movie How to Train Your Dragon: The Hidden World UV or iTunes Code to your computer and compatible devices. From Dream Works Animation comes the highly anticipated culmination of one of the most popular animated franchises in film history, How to Train Your Dragon: The Hidden World. What began as an unlikely friendship between an adolescent Viking and a fearsome Night Fury dragon has become an epic trilogy spanning their lives. In this next chapter, Hiccup and Toothless will finally discover their true destinies: the village chief as ruler of Berk alongside Astrid, and the dragon as leader of his own kind. As both ascend, the darkest threat they�ve yet faced�as well as the appearance of a female Night Fury�will test the bonds of their relationship like never before.